Are your trees threatened by the Emerald Ash Borer? Use our EAB zip code look-up page to find out. Or call us at our EAB hotline, 802.922.3428. The Emerald Ash Borer, an insect that has decimated ash tree populations across large swaths of the U.S. and Canada, is now in Vermont. 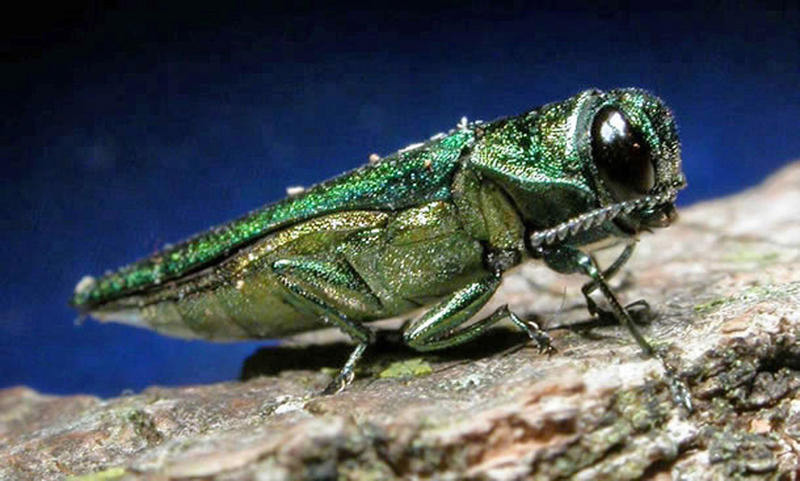 The insects have been confirmed in Orange, Washington and Caledonia Counties, the first Emerald Ash Borer (EAB) infestation discovered in the state. Adult Emerald Ash Borer beetle. Teachers Tree Service can help with these decisions. First, you can find out whether your ash trees are threatened right now by using our EAB zip code look-up page. Then use our EAB contact form, at right (or below, on your phone) to let us know if you want to talk with us right now about your trees, or would like us to get in touch when the infestation is closing in on your woodlands. What can Teachers Tree Service do? We can help landowners and municipalities deal with the Emerald Ash Borer threat by inspecting trees to determine whether they’re infested, and providing advice on how to prepare for and respond to the eventual arrival of the EAB. As licensed professionals, Teachers Tree Service can treat healthy trees with a systemic insecticide that will last two years and be guaranteed. The treatment involves the application of chemicals, something we are usually reluctant to do, but a living ash tree is a lot better for the environment than a dead one. While it’s likely that almost all of the ash trees in Vermont will be killed by the EAB, it’s also true that almost any individual, currently healthy tree can be saved. 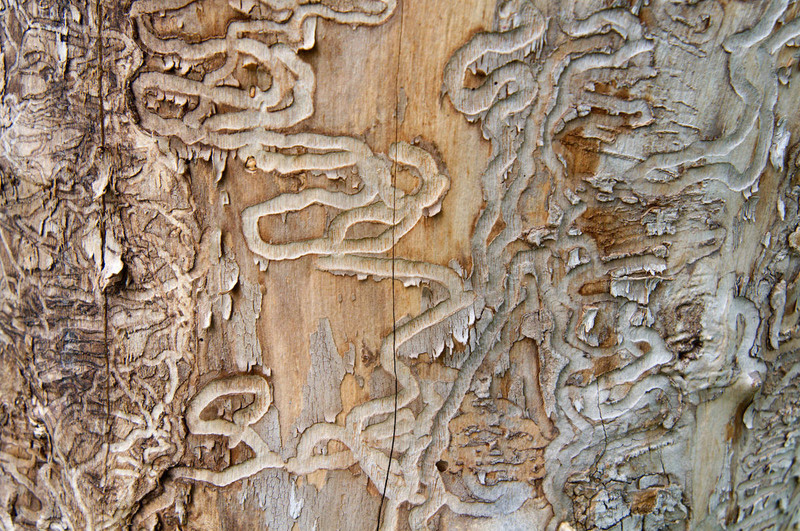 ‘Galleries’ created under the bark of an ash tree by Emerald Ash Borer larvae. Trees in infested areas will need to be treated, or removed. In other parts of the country, the mortality rate for untreated trees is near 100 percent. And infested trees should be removed promptly. Waiting till a tree dies from an EAB attack increases the expense, because trees fall apart and are unsafe to climb. Barnet, Barre City, Barre Town, Berlin, Bradford, Braintree, Brookfield, Cabot, Calais, Chelsea, Corinth, Danville, Duxbury, East Montpelier, Elmore, Fairlee, Fayston, Granville, Groton, Hardwick, Marshfield, Middlesex, Montpelier, Moretown, Morristown, Newbury, Northfield, Orange, Peacham, Plainfield, Randolph, Roxbury, Ryegate, St. Johnsbury, Stannard, Stowe, Strafford, Thetford, Topsham, Tunbridge, Vershire, Waitsfield, Walden, Warren, Washington, Waterbury, Waterford, West Fairlee, Wheelock, Williamstown, Wolcott, Woodbury and Worcester. You can use our EAB zip code look-up page to find out whether your town is affected right now. Even if your town is not yet in the crosshairs, it’s a good time to make plans for dealing with the inevitable arrival of the Emerald Ash Borer in your woods. Strategies include planting non-ash trees to take the place of trees that may be lost to the EAB, and selecting individual trees that are particularly important to you for treatment. Native to northeastern Asia, the EAB was first discovered in the U.S. in Michigan in 2002, though it is believed to have arrived in the 1990’s. The Emerald Ash Borer is now established in more than 30 states and three Canadian provinces. The adult beetles are about half an inch long and metallic green. Their larvae tunnel through the wood just under the bark of ash trees, killing the tree by cutting off the flow of nutrients. Healthy ash trees typically die within three to five years of showing their first sign or symptom. All species of ash trees in Vermont are susceptible. If you think we can be of assistance in preparing for or dealing with an EAB infestation, please drop us a line using our contact form; e-mail us at treeguy4019@gmail.com, or call us at 802.316.1545. Please contact me when it's time to treat my ash trees.